It’s a bold choice to go for a red rug in your space, but you’ll quickly love how it ties your room together and adds a captivating decorative accent. 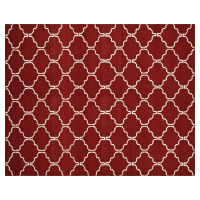 At Brosa, we have a range of red rugs in different shades, textures, and sizes. Choose between two tones or contrasting colours. Go for a 100% wool rug if you’re looking for texture or buy a cotton rug for high traffic areas. 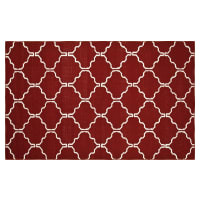 To add personality or a show-stopping centrepiece to your room, find a vibrant red rug. But if you’d rather use it to anchor your room and bring together the other elements, you might prefer a more subdued rug in a softer hue. Make sure your rug complements existing decor by keeping your couches and other furniture neutral and adding red accents to your homewares. At Brosa, we want to be sure you have a rug that will last. So our rugs are designed and made by experienced artisans in areas such as India where time-honoured rug-making traditions exist. That’s right, you’ll be getting a rug crafted by a team that has received its knowledge from generations of artisans. For rugs designed to last more than 20 years, browse our complete collection of rugs online at Brosa today.